Milo celebrated its 175th anniversary in January of 1998. In July of that year, there was a week long celebration. The pictures on this page are from the Parade held on Saturday, July 18th, 1998. They were loaned to the Historical Society by Rodney Stoll. Milo was first surveyed and lotted as Township No. 3 in the seventh range north of the Waldo patent. The first person to make a permanent settlement here was Benjamin Sargent from Methuen, Mass. in May 1802. Milo was founded the next year. Today Milo is home to approximately 2,600 people, and this year it celebrates its 175th anniversary. 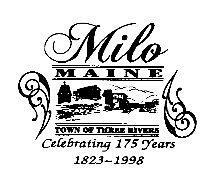 To celebrate this landmark in the town’s history, Milo’s 175th Anniversary Committee has scheduled 10 days of entertainment and excitement running from Thursday, July 9 to Sunday, July 19. The carnival comes to town on Thursday, July 9 in the shape of Smokey’s Greater Shows, and stays through Sunday, July 12. Expect rides, sideshows, food and entertainment for everybody. From 9 a.m. to 3 p.m. there will be the American Legion Auxiliary craft fair. bake sale and flea market. A public lunch will be available. At 10 a.m. will be a woodsmen’s competition at the American Legion field on West Main Street. There will he a ballroom dancing exhibition at the Milo Town Hall, Wingler Auditorium at 8 p.m. Following the exhibition wilt be a public dance with jukebox entertainment. Sunday, July 12, heralds the opening of “Old Home Week.” Times will vary throughout the week. Throughout the five days from Monday, July 13, to Friday, July 17, historical exhibits will be displayed throughout the town in various local businesses- There will also be a tennis tournament running throughout the week and a Civil War display at the Milo Historical Society. Thursday, July 16, sees the enactment of a Civil War play titled, “On Picket Duty” at Milo Town Hall, Wingler Auditorium. On the evening of Friday, July 17, SAD 41 parking lot is the place to be at 6 p.m. for a doll carriage/wagon parade, a bike parade and an ATV parade. Following the parades will be a fireworks display over the Sebec River starting at 9 p.m. and a lighted boat parade on the river at 9:45 p.m.
At 9 a.m., Main Street Crafters opens with vendors at the Fleet Bank parking lot. Also vying for your attention at 9 a.m. will be the 20th Maine Civil War Reenactment camp. The camp will he located in the field behind the Mile Farmers Union Building, adjacent to the Evergreen Cemetery. The Maine Basketball Hall of Fame Wall will also be on display from 9 a.m at the Milo Town Hall Dining Room. At 10 a.m., a “mammoth parade” begins. The parade will start at Dexter Shoe parking lot. From there it will continue down Park Street, Main Street, West Main Street and will terminate in the high school student parking lot. The meal will consist of chicken, baked beans, hot dogs, rolls, coleslaw, chop suey, salads, desserts, coffee, tea, iced tea and punch. Prices are $5 for adults and $2.50 for children under 12. At I p.m., will be the True Value / Jimmy Dean Country Showdown in the Dexter Shoe Co. parking lot. The event is cosponsored by the 175th Anniversary Committee and WDME. There will be a dedication ceremony of the Civil War Monument in the Evergreen Cemetery at 2 p.m. Finally on Saturday, there will be a street dance with “Entity” in the Dexter Shoe parking lot. The fun begins at 9 p.m.
At 8 a.m., the Katahdin Country Club is hosting a 4-ball golf tournament. Then, at 10 a.m., you can take your pick, tennis or horseshoes. Those choosing tennis should make their way to the Elm Street Tennis Courts for a tennis tournament. If horseshoes is more your game, there is a horseshoe tournament scheduled at the American Legion Field on West Main Street. MILO − The quaint, rural town of Milo will take on a dramatic transformation beginning July 8. In celebration of the town’s 175th Anniversary a week-long festival, unlike any the town has ever seen, will fill the streets with hundreds of well-wishers. Years of planning will conic to fruition this week, marking yet another mile stone in Milo’s rich history. Members of the 175th Anniversary celebration planning committee have lined up a spectacular week of events that include, a mammoth parade, fireworks, dancing and a Civil War reenactment. Bents kick-off Wednesday in the Dexter Shoe parking lot with the opening of Stookey’s Greater Shows. sponsored by Masonic Lodge #44. Participants can join in the party with free admission, or ride the midway by paying one set price. The fun starts at 5 p.m. weekdays and is open at I I a.m. on Saturday. For those less adventurous at heart, Saturday, July 11, the American Legion Auxiliary will be hosting a craft fair, bake sale and flea market. Also offered, will be a public lunch from 9 a.m. to 3 p.m. Events will then take on a more masculine flair with a traditional woodsman competition at the American Legion Field on West Main Street beginning,, at 10 a.m. For those wishing to test their vertical ei itcal skills, a climbing wall will be available at the same location and time. Fancy footwork will fill Saturday evening with a Ballroom Dancing Exhibition and a Line Dancing Expedition in Wringler Auditorium, beginning at 8 p.m. A public dance with Jukebox Entertainment will follow and the celebration will drift into the wee hours of Sunday morning. Area churches will be holding Ecumenical Church services Sunday at various times through out the day. During the week of the July 13, the celebration revs up for the big weekend festival. Business throughout town will be displaying historical items hroughout the week, with the possibility of several business open houses. Various summer I tivities are scheduled for the week, including a tennis tournament. In preparation for the 20th Maine Company B Civil War Reenactment Camp July 18, the Milo Historical Society will have a Civil War Display at the Museum on High Street. A Civil War play entitled “On Picket Duty” will be playing in Wringler Auditorium in the Milo Town Hall, July 16, beginning at 7 p.m.
Children are encouraged to decorate bikes, doll carriages, wagons etc. to show off during the event. One of the many highlights of the celebration will be a fireworks display over the Sebec River at 9 p.m. Friday, July 17, followed by a lighted boat parade on the river. Celebration attendees can fill up at a pancake breakfast sponsored by the Piscataquis Lodge, to be held at the Masonic Block Building on Main Street. Walking of breakfast will be a breeze while visiting the Main Street crafters and vendors along Main Street and in the Fleet Bank parking lot starting at 9 a.m. The volunteer infantry regiment will give talks and demonstrations on the life and times of the 1861-865 period. Appearing in the movie “Gettysburg” and “Andersonville Prison” the 20th Maine presents an accurate portrayal, as possible, of camp garrison life of the soldier of the era, with drills, musket firings, mock battles, camp fire cooking, and fatigue duty. Women and children will portray the civilian aspects of the time and have a fashion show of the clothing of the period, and “recruit” the younger visitors into the Union Army. The reenactment will be complete with visits to the surgeon and fraymaster. oaths of allegiance and drills. The 20th Company B Maine Group will be setting up their encampment behind the Milo Farmer’s Union, They will also be marching in the parade and participating in the dedication of the Civil War monument at Evergreen Cemetery on July 18 at 2 p.m.
A “mammoth” parade will begin at Dexter.-Shoe at 10 a.m. Saturday. The parade path will flow down Park Street, Main Street, West main Street and will terminate at the high school parking lot. Some of the participants in the parade include “Maine’s Own” 195th Army Band, Maine Amy National Guard, the Anna Temple Shrine Mini bikes, flag unit and keystone cops. Following the parade the American Legion Auxiliary will be holding a chicken barbecue at 12 p.m. At I p.m,. The 175th Committee in conjunction WDME will be cosponsoring the True Value/Jimmy Dean Country Showdown in the Dexter Shoe parking lot. A dedication of a Civil War Monument will take place at Evergreen Cemetery at 2 p.m. Topping the event-packed day will be a street dance with Entity in the Dexter Shoe parking lot. Athletic events will conclude Milo’s 175th Celebration. A 4-Ball Tournament will be played at the Katahdin Country Club at 8 a.m., a Tennis Tournament at the Elm Street Courts will be at 10 a.m. and the final event of the celbration will be a horseshoe tournament the American Legion Field on West Main Street. Members of the Milo 175th Committee invite all to join in the giant anniversary celebration and help them to enjoy the months of hard work and planning put into the event. The following are pictures from the Parade held on Saturday, July 18th, 1998. These pictures were loaned to the Historical Society by Rodney Stoll. MILO − Hundreds of eyes glanced nervously at the darkening sky Friday evening. Thunder roared and lightening flashed, causing a few to scurry for cover. Despite the less than perfect conditions many braved the pelting rain to view a cornucopia of vibrant colors, celebrating Milo’s 175th anniversary. Streets were lined with people along the Sebec River as a fireworks collage, unlike the town has ever seen, boomed over the storm’s thunder. Many arose early Saturday to join in a pancake breakfast at the Piscataquis Lodge. Before the parade began, visitors and spectators strolled Main Street stopping to visit with the numerous crafters perched along the walk. At 10 a.m. sharp, the sound of sirens cut through the humid air, silencing − for a moment − the shrill, excited screams of children. The anticipation of what was to come around the street comer showed through their wide grins and loud giggles. The parade was the picture of any child’s dream, fire engines, police cars, motorcycles, horses, cartoon characters, mini race cars, military men and most importantly − lots of candy. After the parade many flocked to the chicken barbecue sponsored by the American Legion Auxiliary. Lines of people stood under the relentless sun for their turn at the traditional feast. Behind the Milo Farmers Union, events took on a more serious tone. Volunteers from the 20th Maine Company B Civil War Reenactment Camp settled in near Evergreen Cemetery to give visitors a taste of what life was like during the Civil War. Men, dressed in clothing from the era, sat around faded burlap tents, and drinking from tin cups with enameled porcelain overlay. Artifacts from the war were arranged on a table for visitors to view and inquire about. Children jumped at the opportunity to hold and even wear a rifle from the no”, foreign age. Country music filled the Dexter Shoe parking lot, sponsored by the 175th Anniversary Committee and WDME, at around I p.m. Saturday, as local bands competed in the True Value/Jimmy Dean Country Showdown. Hometown favorites Entity, put on a super show, missing first place by only one point. Winners of the regional competition were Honky Tankers from Sangerville. Thanks to Blue Hill Pyrotechnics, a free encore presentation of Friday night’s fireworks were held over the Sebec River. The pyrotechnics experts once again lit up the sky over Milo, but this time the skies were clear. After the fireworks display people enjoyed a street dance with the band Entity. Hundreds showed up for the chance to kick Lip their heels, dancing well into Sunday morning. Event volunteers said they were pleased at the turnout of the anniversary celebration. The wide variety of events seemed to cater to everyone’s tastes from children to seniors. Milo celebrated its anniversary with friends and family, and what a party it was. The Milo Historical Society wishes to announce an exciting and fun project in conjunction with the celebration of Milo’s 175th Anniversary. Members of the Society have chosen to create a time capsule which will preserve a collection of memorable and significant items reflecting our community and lives in 1998. The Society hopes that individuals, schools, organizations, and businesses will take the opportunity to reflect and contribute an item representing the way they would like to be remembered by future generations. Plans are to place the capsule in a secure, accessible location; with instructions for it to be opened in 50 years. This is a unique way to be part of our community’s history and to give future generations a view of how we live and who we are as residents of Milo in 1998. Over the next several months, the Historical Society will be contacting various individuals and groups for their ideas, participation and contributions. We plan to have items gathered and an opportunity to view them during Milo’s 175th celebration on the weekend of July 18. All community members are encouraged to join the Historical Society in what we hope will be a fun and meaningful project. The Time Capsule is burried a few steps from the Milo Historical Society’s front door. The pictures on this page were loaned to the Historical Society by Rodney & Ellen Stoll. The articles are from the Piscataquis Observer and Bangor Daily News, and were saved by Corrine Barden. Special thanks to Seth Barden for scanning the pictures and creating this page!